Chatelaine Cullinan was at the Sustainable Living and Indigenous Plants Fair held at the Botanic Gardens in Pietermaritzburg. Her forte is Permaculture and she had her first book on Permaculture with her. Chatelaine was delighted to participate in the Sustainable Living and Indigenous Plants Fair held in the Botanic Gardens in Pietermaritzburg. 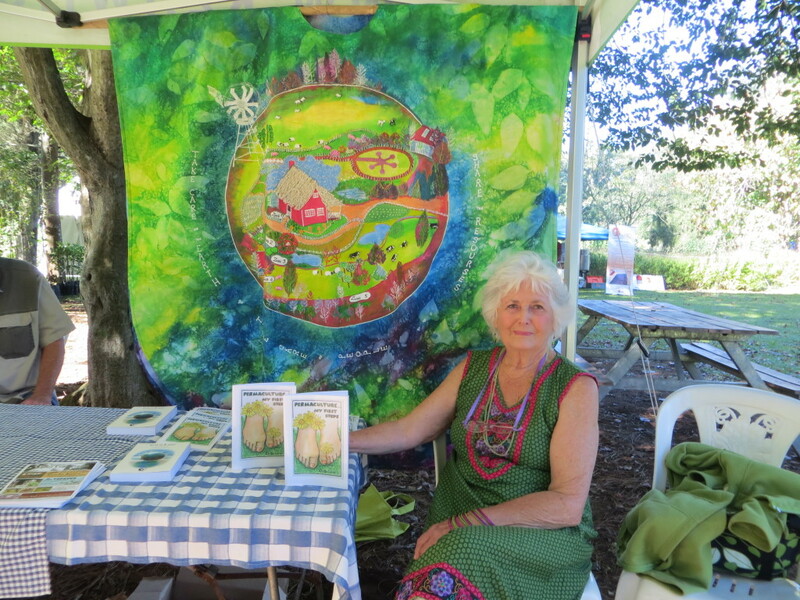 She is passionate about permaculture and, at her stand, as her back drop, had an incredible quilt she has made that clearly shows how permaculture works with the different zones. She had with her, her umSinsi published books “Permaculture – My First Steps”. On Thursday 600 children visited the fair with its many stalls with varying produce, books, plants, jams, organic fertilisers and much to do with kindness to the earth. There were films too and many speeches. Chatelaine explains in her book the work of special worms which she calls “purple girls”. Indeed, Permaculture with its organic nature produces food that grows to have the best flavour and to maximum size. With food a priority, permaculture needs to be taken seriously! Congratulations to Chatelaine!